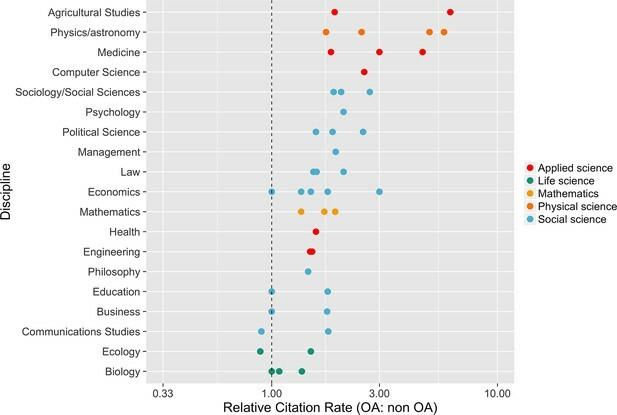 Open access articles get more citations. The relative citation rate (OA: non-OA) in 19 fields of research. This rate is defined as the mean citation rate of OA articles divided by the mean citation rate of non-OA articles. Multiple points for the same discipline indicate different estimates from the same study, or estimates from several studies. References by discipline: Agricultural studies (Kousha and Abdoli, 2010); Physics/astronomy (Gentil-Beccot et al., 2010; Harnad and Brody, 2004; Metcalfe, 2006); Medicine (Sahu et al., 2005; Xu et al., 2011); Computer science (Lawrence, 2001); Sociology/social sciences (Hajjem et al., 2006; Norris et al., 2008; Xu et al., 2011); Psychology (Hajjem et al., 2006); Political science (Hajjem et al., 2006; Antelman, 2004; Atchison and Bull, 2015); Management (Hajjem et al., 2006); Law (Donovan et al., 2015; Hajjem et al., 2006); Economics (Hajjem et al., 2006; McCabe and Snyder, 2015; Norris et al., 2008; Wohlrabe, 2014); Mathematics (Antelman, 2004; Davis and Fromerth, 2007; Norris et al., 2008); Health (Hajjem et al., 2006); Engineering (Antelman, 2004; Koler-Povh et al., 2014); Philosophy (Antelman, 2004); Education (Hajjem et al., 2006; Zawacki-Richter et al., 2010); Business (Hajjem et al., 2006; McCabe and Snyder, 2015); Communication studies (Zhang, 2006); Ecology (McCabe and Snyder, 2014; Norris et al., 2008); Biology (Frandsen, 2009b; Hajjem et al., 2006; McCabe and Snyder, 2014). Increase in open access policies. The number of open access policies registered in ROARMAP (roarmap.eprints.org) has increased over the last decade. Data are broken down by type of organization: research organization (e.g., a university or research institution); funder; subunit of research organization (e.g. a library within a university); funder and research organization; multiple research organizations (e.g., an organization with multiple research centers, such as Max Planck Society). Figure used with permission from Stevan Harnad. Preprint servers and general repositories accepting preprints. * All these servers and repositories are indexed by Google Scholar. † Most, if not all, of those marked ’Yes’ require some type of login or registration to leave comments. ‡ arXiv provides internally managed persistent identifiers. § e-LiS is built on open source software (EPrints), but the repository itself, including modifications to the code, plugins, etc. is not open source. ¶ MPRA is built on open source software (EPrints), but the repository itself, including modifications to the code, plugins, etc. is not open source. ** PhilSci Archive is built on open source software (EPrints), but the repository itself, including modifications to the code, plugins, etc. is not open source. †† The Winnower charges a $25 fee to assign a DOI. Special funding opportunities for open research, training, and advocacy.